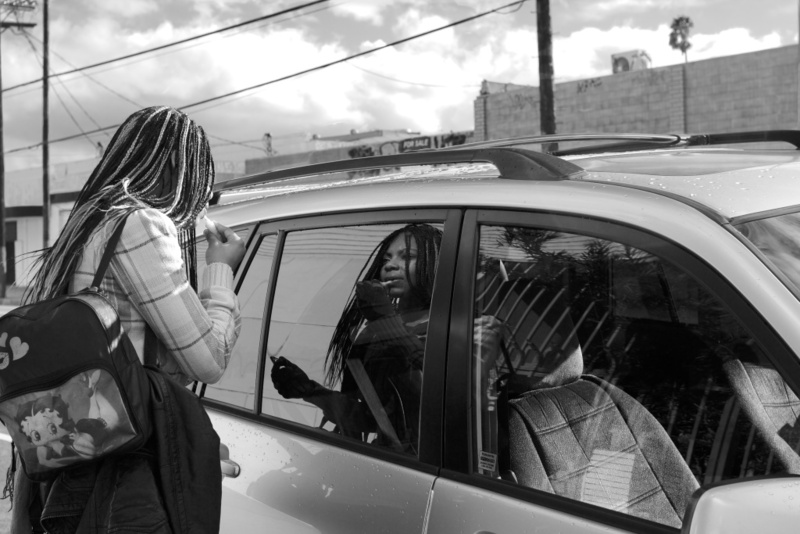 "Mirror Mirror" – Historic South Central. According to the LA Times only 1 in 4 adults in this district have completed high school which is the second-highest in Los Angeles. 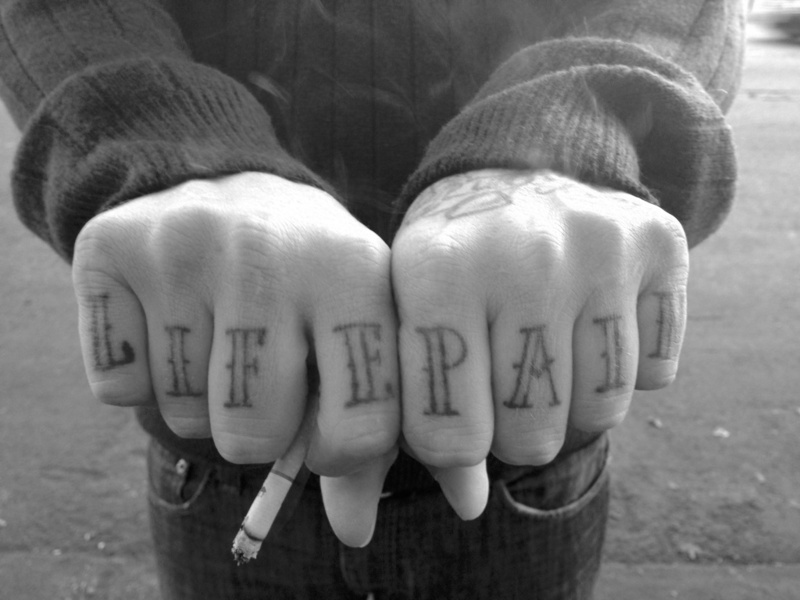 "Life Pain" – Born in Hollywood, Chris found himself in the foster care system at the age of 8 when both of his parents were convicted of murder. He and his 5 sisters were separated and he hasn't seen them since the late 80s. He has since lost all contact with them with Facebook and internet searches turning up nothing. He has learned that his father, a gang member, had died of hepatitis, which he contracted from drug use. His mother, a prostitute whom he last saw in 1987, had returned to jail shortly after being released after time served for her role in murder. This time for robbing a bank with partners she met while doing time. Chris followed in his parents' foot steps. Running away from the foster care system he ended up living on the streets. While in the streets, he was arrested with Ronald Reagan's grandson for something to do stolen property. 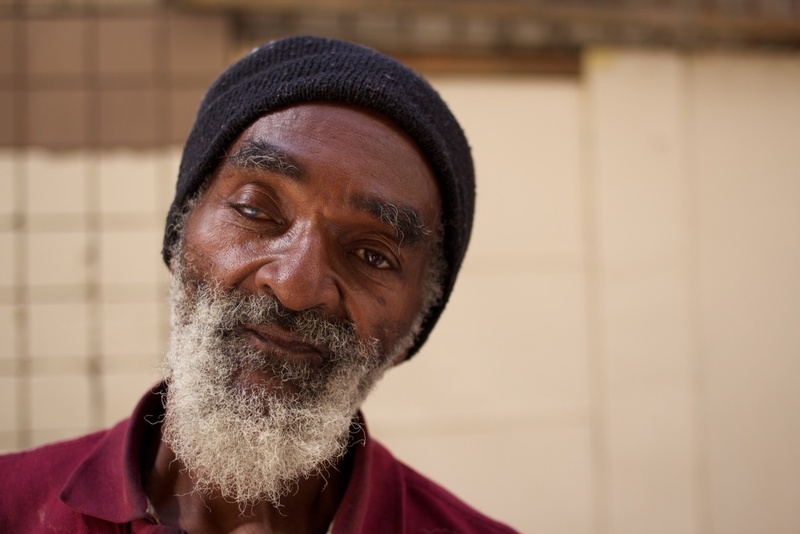 After being released from jail, he found himself on Skid Row where he's been living for a year and a half. He has been clean and sober for 8 months. He's about to finish a food service program where he will be able to work in the food an restaurant industry. "Even When He's There, He's Not"
"Vincent Lee Owens" – "I want to dedicate this to KK." KK is his grand baby who lives in DC with Tasha. Vincent is 60 years old which he proved by pulling out his ID and showing me. He was packing up his tent when we met him but he had time for some words with us and even showed us his skating skills. 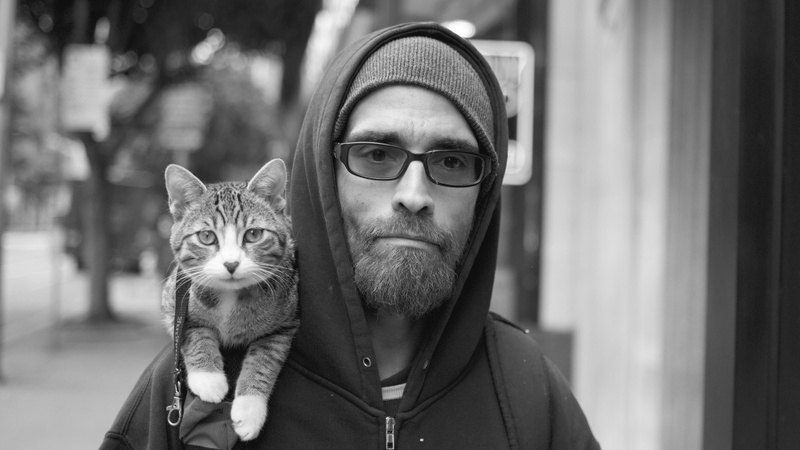 "Matt and Dog" – The cat, named Dog, sits on the shoulder of Matt as he walks around downtown LA. He was just finishing a smoke when I ask to make their picture. He agrees and when parting Matt asks for some change. I give him what coins I have noticing his sweatshirt. As he walks away I ask him about it. My assumption was close but wrong - I thought it was a particular punk band, while it was punk it was Against the Stream "Kind of a Buddhist Punk band...a recovery program," Matt tells me before we split ways. 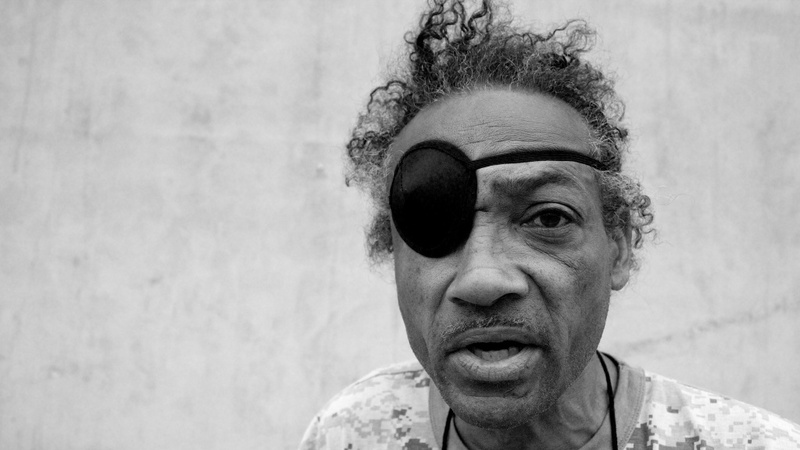 "Dante" – The front man for the Dante's Inferno who preformed in Skid Row's Gladys Park, at a weekend event show casing local artists put on in part by the Los Angeles Poverty Department. 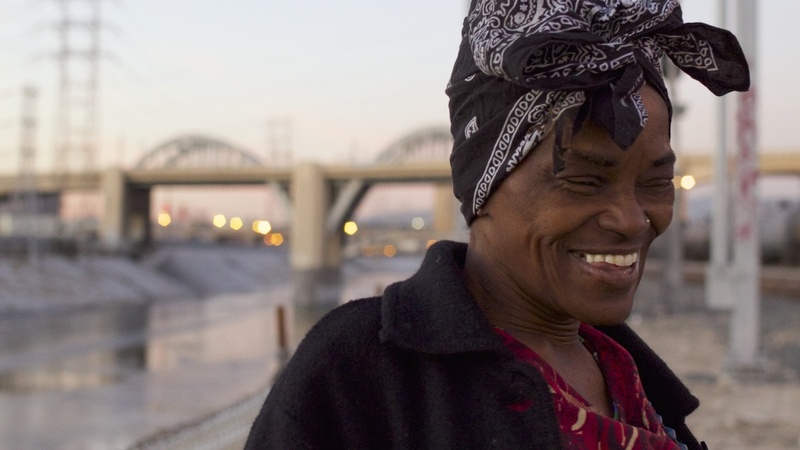 "Lashawn" – A resident of the Los Angeles River where she has lived for the past four years along with her cats: Kim and her two, Greedy and Blanket. Lashawn was at first reluctant for me to take her picture, but allowed me to photograph her cats. Kim, who was featured in my last post, was very willing but Blanket and Greedy were much more skittish. After a few minutes of watching me take pictures of her cats she let me take a few of her and Kim. The day I met Lashawn the folks who normally being her food had not and as the sun was setting looked like she wasn't going to have dinner this evening. "Tracy" – He has been living around the area on and off for several years. A one time actor he is familiar with the history both his neighborhood and the industry that once employed him. He rattles off a list of the movies that have used his location from Terminator 2, Dive, Fast and the Furious. When asked why so many use the 6th Street Bridge he answers, "This is the only way to get down here, The next entrance is way down there." An obvious answer to one in the know. As we stand under the bridge, in the LA River, we talk about his neighbors and he mentions that some live in the bridge. He points at some evidence of clothes hanging from the metal structure. He goes on to lament the state of disrepair of the bridge and the new city plans to revitalize the area. 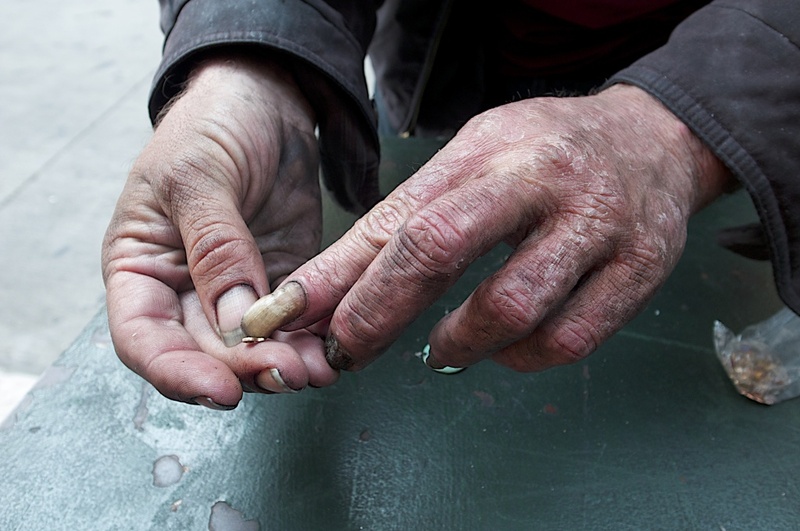 "Bill's Hands" – An Urban Gemologist. Bill looked about as comfortable as you can get on the streets, where he's made his home for the past 3 years, reclining on a box drinking a soda. After a minute or two of conversation Bill pulls out a small black pouch filled with his livelihood. The smallest scrapes of gold, clasps, links small but bright stones. The fallings from grace from the store fronts in the Jewelry District in Down Town Los Angeles. These bits are too small to be picked up or to even noticed and so are swept out to the sidewalk where Bill learns a living doing what others will not, seeing them and bothering to collect them. Bill tell us of some of his bigger finds including rubies, sapphires and diamonds and some being a couple of carats big. When he has collected enough scraps to matter he will then sell it back to a few jewelers he trusts. . It seemed that Bill is both well known and liked as two folks passing by stop and greet him. One bragging about Bill saying he knows his stuff more than a lot of the professionals working in the stores. Before the iPhone and Instagram even existed, Sam Smotherman was already doing mobile photography – on a Palm Treo. Known as @whittiersam on Instagram, he's known for his intimate street portraits taken all over Southern California. Sam Smotherman's street photography (not all of them mobile) will be on display this Saturday at FWD Studio in Chinatown. When he first started experimenting with mobile photography, he never photographed people. Smotherman liked juxtaposing objects and compositions with witty tags. "I'd take a picture of a spilled coffee and write, 'coffee murder,'" he said. But everything changed for Smotherman when the first-generation iPhone came out in 2007. 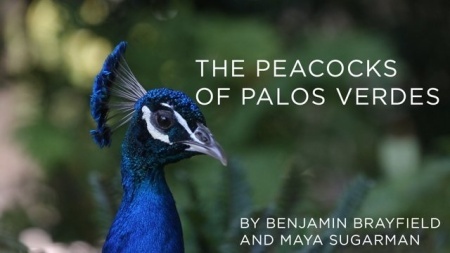 He began walking around L.A. with his iPhone in hand, documenting people on the street and asking them about their stories. Smotherman started posting his pictures to Instagram with narrative captions. By 2011, he had become part of the Instagram street photography community. Along with NYC Instagrammer Renzo Grande (@aliveinnyc) he launched the 24 Hour Project – the world's largest street photography experiment. "Street photography is about the person you're documenting," Smotherman said at KPCC's 24 Hour Project/Workshop event last June. "The moment wasn't created, it just happened." Smotherman likes to get to know many of his subjects. In December 2012, he met Tracy (slide #8) at an Instawalk put on by Instagram Lovers Anonymous. 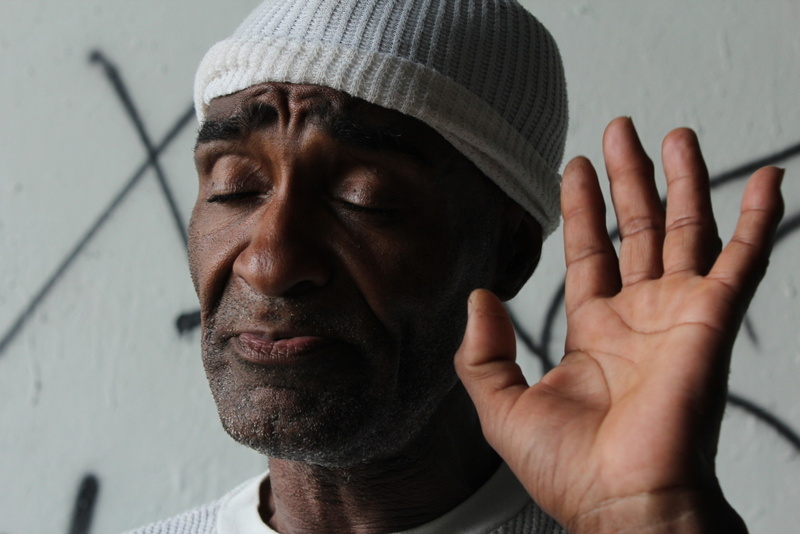 Tracy has lived on the Los Angeles River for 10 years; he lives near the Sixth Street Bridge. Smotherman comes and checks on him from time to time. 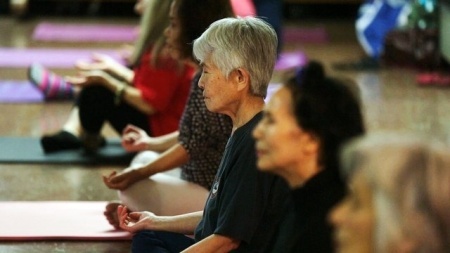 "These are people who are often overlooked, not looked well on," he said. "A lot of them are on the margins." We see people like Tracy in L.A. a lot but we don't always think about their stories, Smotherman said. He likes to sit down and listen: "finding out how they live and what they do to survive," he said. 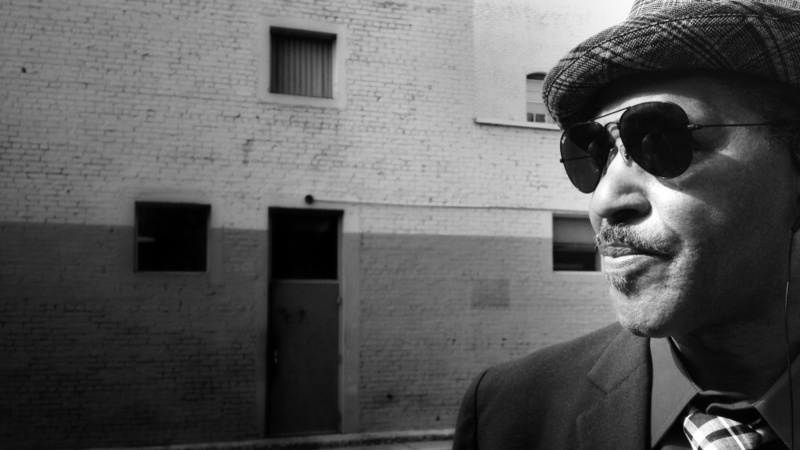 Smotherman is calling the show "Souls of L.A.," documenting the people who give Los Angeles their soul. "Souls of L.A." will soon also be a website home to the ongoing series, giving his photographs a little more screen space than on mobile phones. Check out Sam Smotherman's photographs in person this Saturday, Feb. 22 from 7 to 11 p.m. FWD Studio is located in Chinatown at 1980A N. Main St., Los Angeles 90031. 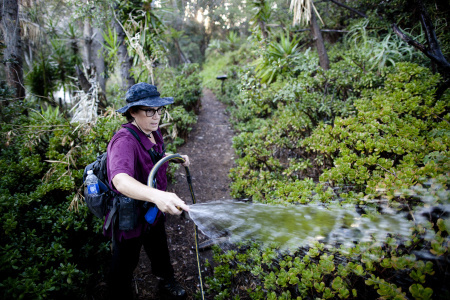 Sabo took over the job more than 10 years ago after Amir Dialameh, the garden's founder, passed away. "If you see a need, go take care of it," she says. 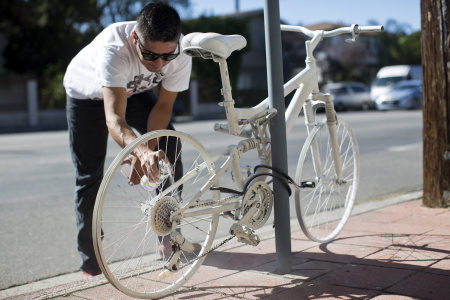 The Ghost Bike Foundation strips bikes, paints them white and places them at the scene of cyclists' deaths as a memorial and to remind drivers to be careful.